"Fans of Terry Gilliam will adore this... Dreamlike and jubilant, it's a film of pure, unfettered imagination"
It really is an extraordinary film. How many others can be reliably identified from a single random freeze-frame even if you've only ever seen a handful of stills? It was fascinating working on Karel Zeman and Ray Harryhausen projects back to back, as they emphasised the differences between the two men as much as the similarities: for all his fantastical creatures, the treatment in Harryhausen's films is always broadly "realistic", but Zeman is colonising his own special planet where absolutely everything is made to bend to his will. It's no surprise that Terry Gilliam and Tim Burton are such rabid fans - Zeman must have achieved pretty much their ideal situation of working in close to total creative freedom (one of the reasons he preferred to stay in remote Zlín rather than move to Prague's Barrandov studios) while still managing to get the necessary backing. My copy has just arrived, and I'm delighted to be able to confirm that the vast majority of the extras are in HD, including the 102-minute Zeman doc. DVD Beaver. It would be fair to say that he quite likes it. This is an incredible release - Second Run's best to date and because it is region FREE - any Blu-ray aficionado can own. This has our highest recommendation - a masterpiece film, in 4K restoration - looking outstanding and a bevy of great extras. What's not to love. Buy with joy! "This is a film that needs to be seen to believed... it's the sort of film Wes Anderson, Terry Gilliam and Ray Harryhausen would make if they spent a few months together taking a lot of hallucinogenic drugs. Wildly inventive, hugely entertaining and eye-poppingly stylised, it's an incredible film that could easily become a personal favourite." 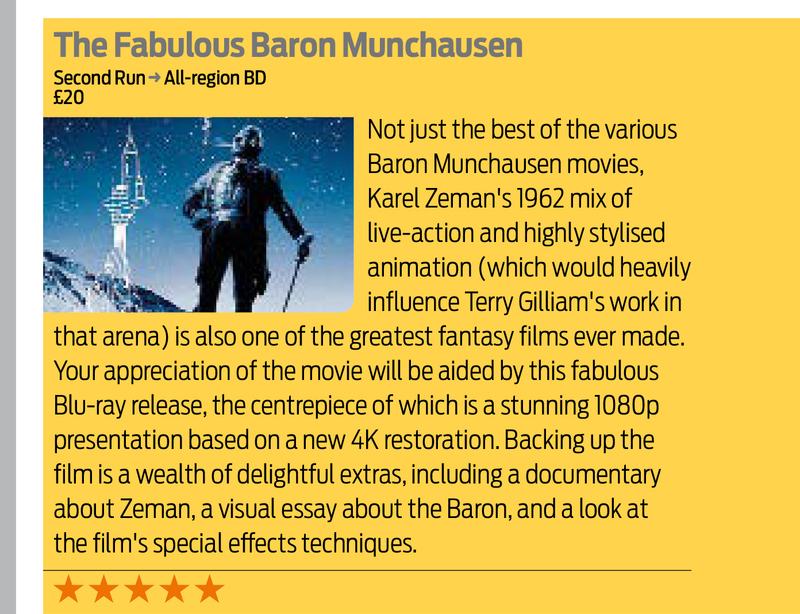 "The Fabulous Baron Munchausen is an absolute wonder to behold: decidedly out of step in its time or any other cinematic era, except maybe alongside the phantasmagorias of Georges Méliès... It’s a one-of-a-kind cinematic experience"
"This is one of the greatest, most enchanting fantasy films ever made, and it’s never looked or sounded better." "The restored 4K-sourced transfer is absolutely stunning with very fine detail, gorgeous colors, and a convincingly rich, cinematic appearance that will have you freeze framing frequently just to admire the visual intricacy on display "
"A glorious 4K restoration of what is arguably the filmmaker's greatest film... This is one of the most important HD releases of 2017 and warmly recommended." "A classic of fantasy cinema that completely deserves its awesome reputation. Every frame of this film looks terrific (in this new 4K restoration the colours pop off the screen) and there’s no wonder that Zeman has inspired some of our most visionary filmmakers... This is a must-own for every serious film fan and, after you’ve watched the main feature, make sure you check out the cavalcade of special features. Very highly recommended." "This Second Run Blu-ray immediately stands as one of the label's finest"
How is this selling? I haven't gotten round to watching my copy yet but absolutely wanting to get more titles like this and would buy the Verne adaptation too. Finch wrote: How is this selling? I haven't gotten round to watching my copy yet but absolutely wanting to get more titles like this and would buy the Verne adaptation too. It looks fine, I've got it as part of e three film collection which is now out of print. They'v restored three of his films and then they seem to have stopped. There are so many more films of his which I'd love to see in Blu-ray. A Jesters Tale, The Stolen Airship, On the Planet and Krabat all are wonderful as well. Last edited by Lost Highway on Sun Aug 06, 2017 7:30 am, edited 1 time in total. I imagine they're as keen to restore the others as anyone posting here, but these projects are unavoidably extremely expensive - and yes, buying the end product is absolutely the best way that you can help accelerate that process, unless you fancy making a large donation directly to the museum. MichaelB wrote: I imagine they're as keen to restore the others as anyone posting here, but these projects are unavoidably extremely expensive - and yes, buying the end product is absolutely the best way that you can help accelerate that process, unless you fancy making a large donation directly to the museum. I'm hoping to visit the Karel Zeman Museum soon as I've recently moved to Berlin and Prague is not far. The Baron Münchhausen included in the three-movie Blu-ray collection I've got appears to be an older restoration and this new 4K restauration looks considerably improved. Yes, the initial triple-pack was just an HD scan. The 4K restorations are a night-and-day improvement: Zeman's work really benefits from ultra-fine detail. "It's an injection of pure movie heroin"
"A film brimming with visual flare... Fabulous." "Offers moment after moment of highly concentrated joy... This is a strong contender for the best-looking disc Second Run has ever released"
A five-star rave in the latest Home Cinema Choice magazine for this "fabulous Blu-ray release, the centrepiece of which is a stunning 1080p presentation"